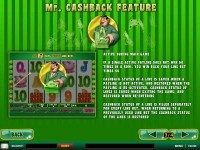 Mr. Cashback is a brand new slot game powered by Playtech software. 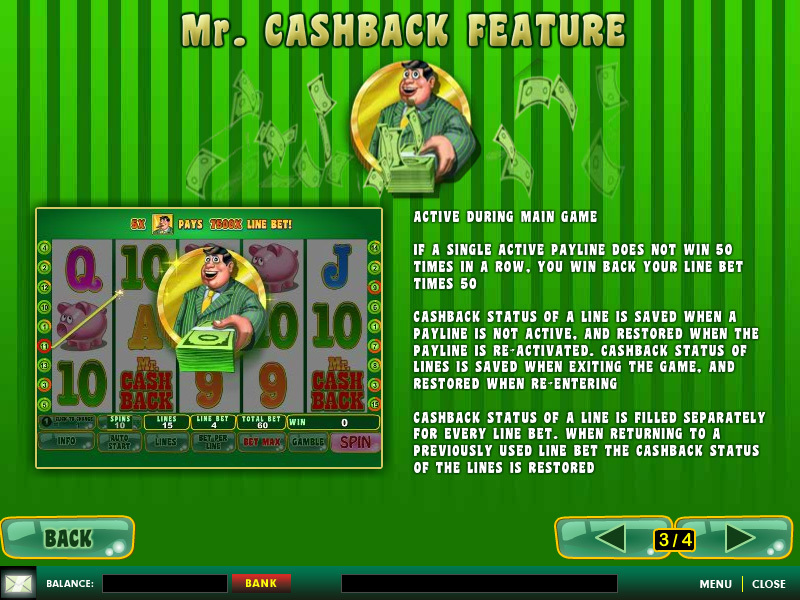 Available at just about any Playtech online casino, Mr. Cashback has a unique feature that pays you for losing. If a single line does not pay anything for 50 spins, you win back your line bet x50. While playing the slot, you will see each line number has a meter that increases every time you spin and the line does not win. Changing your line bet will reset those meters, but they are saved for when you go back. 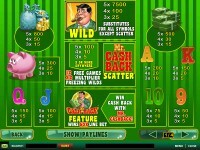 The layout is simple with 5-reels and 15-paylines. This is unusual for a new release, but it works well with this game. You can bet between $0.01 and $5 per line and the payout potential for any bet size is perfect for any budget. 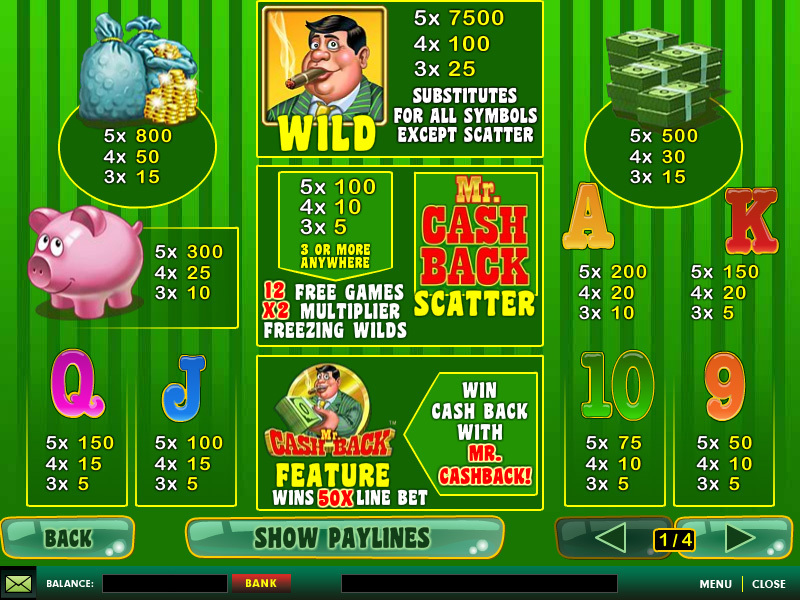 The ultimate win in the game with a single spin is worth 7,500 coins for five Mr. Cash Back symbols on an enabled payline. The theme of Mr. Cashback revolves around money and the symbols are all thematic and are in the form of Bankers, Bags of Money, Stacks of Cash, Piggy Banks and more. 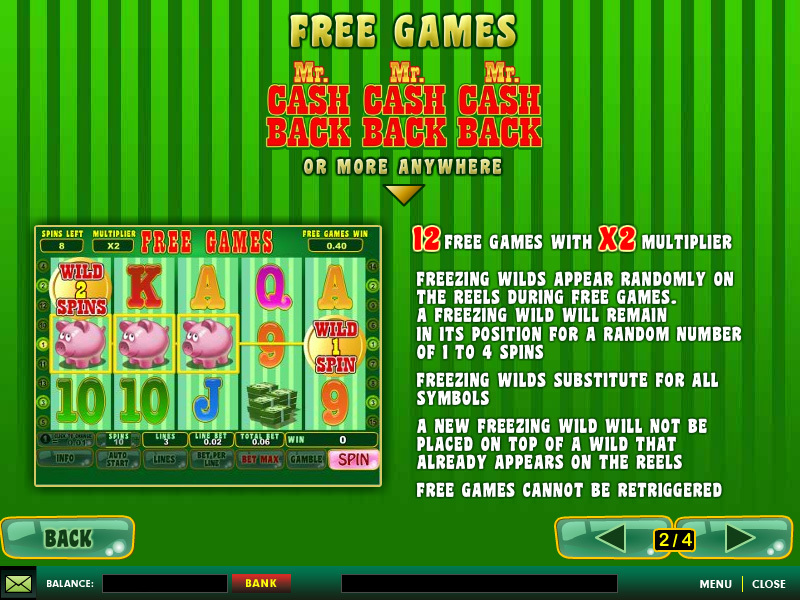 The wild symbol is the Mr. Cash Back icon, which substitutes for all other icons in the game besides the scattered logo. The wild will bring the highest payout in the game, so the more that appear on the screen, the better. The scatter is the Mr. Cashback logo and it appears on all reels. If three or more scatters appear in any position in a single spin, you will earn 12 free games with a x2 multiplier. During the free games, Freezing Wilds (wilds that stay in place while the reels around them spin) appear on the reels and will hold its position for between 1 and 4 spins. The free games cannot be retriggered, and there isn’t a classic second bonus feature in the game. Without a traditional second feature and fewer paylines than most new games being released, I would still recommend this game to fellow slot lovers. If you want to give it a spin, try it at Casino.com.